So you've decided to take the plunge with Windows 8.1 (following the changes with the latest update, maybe), and you want to know how to jazz up the old desktop? You know, the mouse-and-keyboard (non-Metro/new-style) bit of the OS where most of us still live. Or indeed, maybe you've had Windows 8 for ages, and just haven't been bothered to do anything when it comes to tinkering in Desktop mode. Well, read on, because in this article we're going to show you the basics of customizing the desktop. Okay, so if you've done nothing with the place, the first thing you want to do is ditch that yellow wallpaper (it's almost as passé as an avocado bathroom suite). Right click on the desktop, select Personalize, and click on Desktop Background at the bottom of the window which pops up. You can then select an image from the set pics on offer, or click Browse to select a folder where one of your own preferred images resides. Note that you can hold the Ctrl key down and select multiple images for a desktop slideshow -- at the bottom, under "Change picture every", you can use the drop-down menu to specify a time interval in which a new image will be brought to the fore. Click the Save Changes button when you're done. Also note that there are a couple of default themes you can choose from in the Personalization window, as well, and you can grab more by clicking "Get more themes online" (top right). This is actually worth a look because there are some pretty smart themes you can download here, featuring some quite striking photos -- have a browse. While you're kicking about in the Personalization window, also bear in mind that you can click "Change desktop icons" (top left) to add back icons you might miss. (Those of you finally making the leap from Windows XP following the cessation of support for the old OS may wonder where My Computer went -- well it's now called This PC, and you can bring it back to the desktop with a tick in the Computer box here). Heading to the taskbar, you can customize this with toolbars. Right click the taskbar, and mouse over toolbars at the top to see a menu pop out to the side -- simply select the toolbar you want from there and it will appear on the taskbar for quick access. The Desktop toolbar provides you with a shortcut to every icon or folder on your desktop, and the Address toolbar provides you with a mini URL window to type web addresses in to go straight to them. You can create a custom toolbar, as well, by selecting New Toolbar, and then browsing to any folder -- this will then give you a pop-up list of links for everything in said folder (including files nested within sub-folders). All very convenient. Still on the theme of toolbars, when you've got a folder open on the desktop, you can customize the icons available on the Quick Access Toolbar (which is at the very top left of the folder's window -- see the image above). If you click on the little down arrow, a menu pops up, and you can select any item you wish to appear on the toolbar (for example, undo or delete). 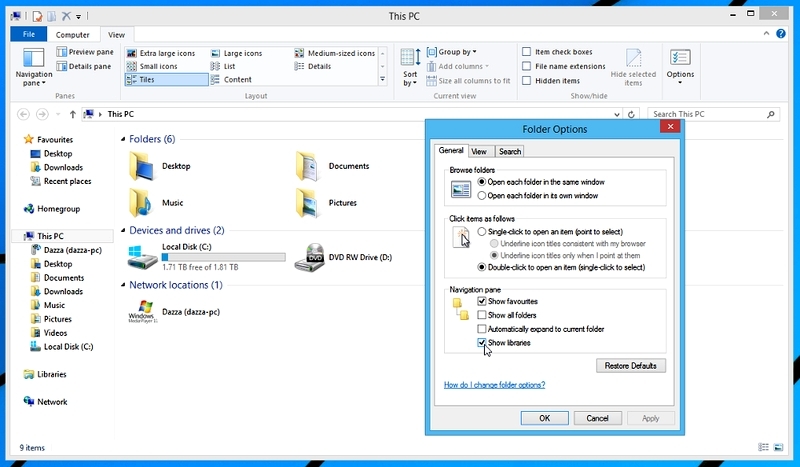 Wondering where your Libraries have gone in File Explorer under Windows 8.1? They're still there, just hidden by default, for some reason. 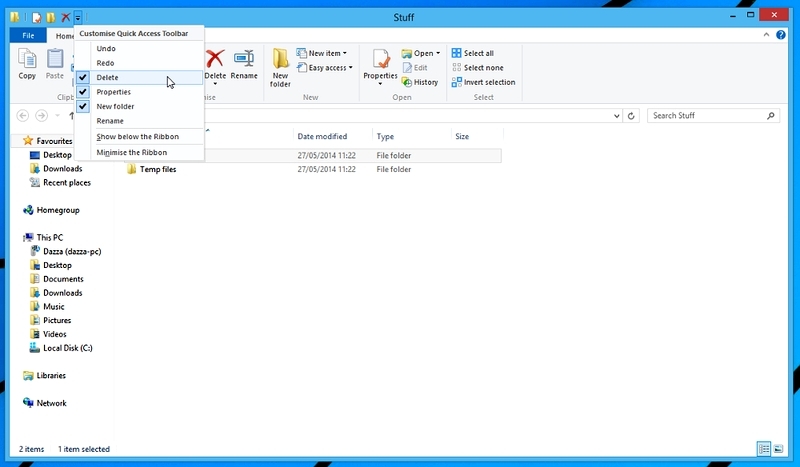 To reveal them, go to File Explorer (from a right click of the Start button), select the View tab, then Options at the far right along the top menu, followed by Change Folder and Search Options. Then under Navigation Pane, click Show Libraries (see below). So, those are some handy basics to be getting on with, but if you'd like to get into a bit more depth with your desktop customization, then there are some great utilities out there. At the risk of sounding like an advert for Stardock, the firm really does make some sterling Windows 8 products -- we'll pick out a pair of them here, followed by another pair of non-Stardock tools. Firstly, there's Stardock's Fences (now on version 2.11), which is a must for those who like to keep a neat and tidy desktop. It allows you to create fenced-off sections of your desktop for a better organized world, and these trays can be easily repositioned or hidden. If you've got a busy desktop, it's a superb way to tame it – Fences will set you back $10 (£6), but there's a free trial available to test it out. 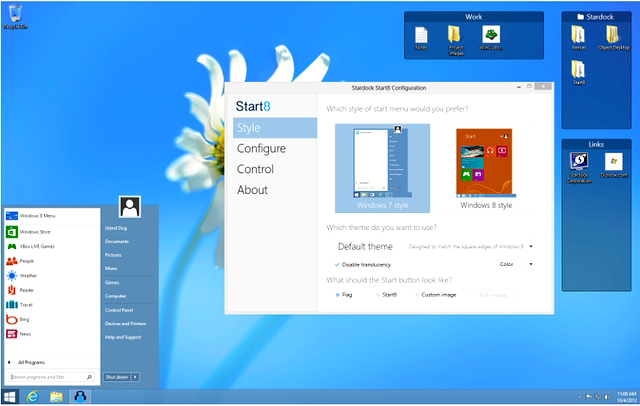 Stardock also makes Start8, which brings the traditional Start menu back to Windows 8 (it's $5 or £3, but if you'd rather not pay, there are lots of great free alternatives to be found here). Also be sure to check out Winstep Nexus, a free tool which adds a really smart dock to your desktop, and it boasts oodles of customization options. Finally, if you want to really get into tinkering and making your own Windows widgets (or 'skins' as the program calls them), check out the open source customization toolkit Rainmeter -- it may take some getting your head around initially, but it's worth persevering. (There are some handy tips here, and also check out the manual to get you started).